Soothe; The Dental Advisor, Vol. 23, No. 6, July/August 2006. Alford A; Clinical Report – The Use of 10%, 16%, 22% Carbamide Peroxide and 3%, 7.5%, 9.5% Hydrogen Peroxide Materials for At Home Vital Bleaching in Combination with Active and Passive Treatment Modalities for Control of Tooth Sensitivity and Gingival Irritation; Oral Health Journal, p90-101, March 2010. Soothe, THE DENTAL ADVISOR, Vol. 23, No. 6, July/August 2006. 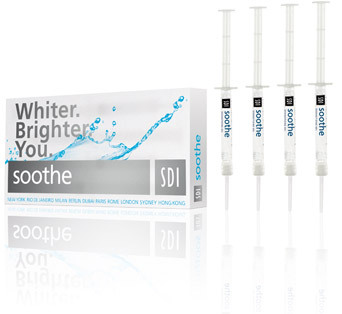 Soothe is a colorless and tasteless, topical desentizing gel containing 6% potassium nitrate and 0.1% fluoride ions. It is designed to relieve tooth sensitivity caused by chemical and thermal changes. Soothe received an 88% clinical rating form 20 consultants. Tooth sensitivity has been attributed to the penetration of hydrogen peroxide into the pulp chamber. It is speculated that reducing the hydrogen peroxide concentration or the duration of bleach application could reduce the tooth sensitivity but would also likely reduce the whitening as well. Hence other desensitising agents, such as potassium nitrate, have been added to carbamide peroxide bleach formulations in an attempt to decrease the tooth sensitivity experienced by the patient without reducing the concentration of the active bleaching ingredient. This study was designed to produce a protocol for the general practitioner that combines known treatment methods and concentrations of materials with known trends, so as to try and decrease the number of applications necessary by using higher concentrations of materials in an incremental approach, also combining the use of active and passive treatment modalities for side effects. Soothe was the desensitising agent used in this study along with Sensodyne Toothpaste. The trend indicates that by incrementally increasing the concentrations of materials and by educating the patients to the active and passive treatment modalities available to the patient for the main side effects, of tooth sensitivity and gingival irritation, an acceptable result can be achieved for both patient and practitioner using the least number of applications necessary.